Under Breast Soreness? No, Intertrigo! 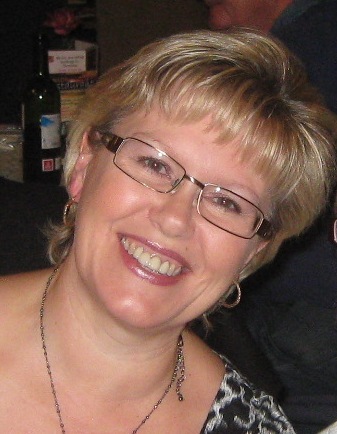 I joined the King’s Lynn Breast Screening Unit in 2009, as an Assistant Practitioner. I started my training in Mammography and very quickly discovered the difficulty in mammogramming women who were experiencing Under Breast Soreness (medical name – Intertrigo). I was also very surprised at the amount of women who came through the service who were experiencing it. This is where my interest began. Back in 2012, whilst studying for my foundation degree in Breast Imaging, I was asked to design a Health Promotional tool for a Health Promotion module. It was an easy decision for me – I wanted to research and design a self-help leaflet for women experiencing UBS. On researching the topic, I couldn’t believe what little information there was on the subject. Due to this, I discovered women who had taken pictures of their under-breast, who had posted them on women’s health blog’s with captions such as ‘OMG, found this under my breast today – is it cancer’? Women were obviously seeking advice on the subject by using ‘Under-breast’ as their initial search wording and appeared only to be getting advice from other women in a similar situation, rather than advice from a true health professional. This saddened and bothered me. I felt that if only these women knew that the medical term for the most common cause of UBS was Intertrigo, they would be able to find a wealth of information on the topic. 7. Give Breast Screening Number as a contact for further help or advice. This leaflet has proved to be very successful and I’ve had some great feedback. Public Health Wales are rolling the leaflet out across parts of Wales and I’ve recently had requests from Leicester and Swindon to do the same. Breast Test Wales have invited me to speak on the subject at their conference in March 2017. I am doing a presentation within my own hospital on the subject next week. I relayed the results of the study to the breast cancer charity, Breast Cancer Care, and they now have information on UBS on their website. Thanks Marilyn, it’s wonderful to see how dedicated professionals can make a real difference when they are driven to do something by what they see in practice. If anyone has specific questions about Intertrigo then don’t be afraid to ask your questions on the hub forum. 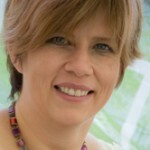 Our health professionals will be able to offer you information and if we’re stuck we can ask Marilyn! This entry was posted in Breast examination, Breast health, Real life experience and tagged intertrigo, Under breast soreness. Bookmark the permalink. Hi. In Bolton there is no policy. Each mammographer makes a decision based on the woman presenting. Personally..iv found that a woman may have over come her ”embrassment ” to attend…and with discussion I agree to go ahead..or she decides to treat and return in a few weeks. Personally..I do not agree the images are quarunteed to be suboptimal. However I do not want to harm the woman! 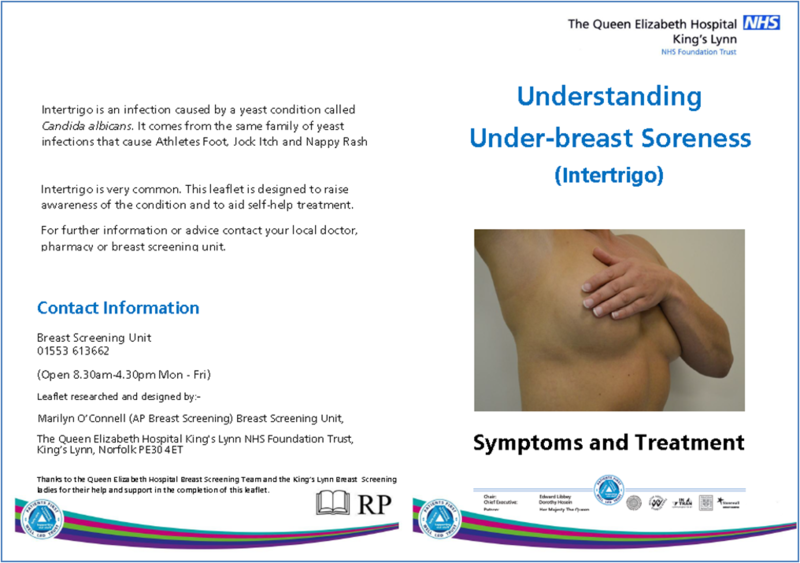 On the Bolton breast unit website you’ll find out leaflets which we give out. We’ve no official policy in East Lancs either, and we’ve developed our own under-breast soreness leaflet. This involved getting an official camera from medical imaging, obtaining the woman’s consent to share the images in writing (with the proviso that they can withdraw consent), and designing the leaflet text and image placement. In practice, I find that some mammographers are more likely to ‘have a go’ than others, but always after a discussion with the woman. I too don’t think that it always leads to sub-optimal imaging, but great care needs to be taken along with a constant two-way communication. What I do is perform the MLO images first rather than the CC, so that I can keep a close eye on how likely the skin is to tear on this, the most taxing position on the under breast crease. I have no idea why we are encouraged to perform the CC images first as a matter of routine anyway, does anyone have any good evidence to show why this is necessary? Hi, having never had this problem before, I developed this condition a few days after having a mammogram. Is it a fungal infection I could have got from, not sanitizing the equipment used?